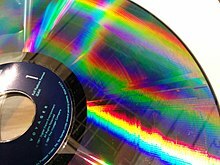 In optical storage, constant angular velocity (CAV) is a qualifier for the rated speed of any disc containing information, and may also be applied to the writing speed of recordable discs. 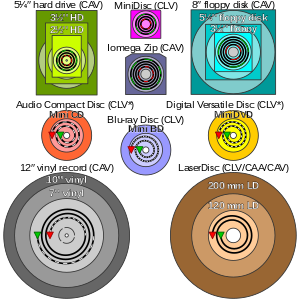 A drive or disc operating in CAV mode maintains a constant angular velocity, contrasted with a constant linear velocity (CLV). A typical CD-ROM drive operates in CLV mode, in contrast to a floppy or hard disk drive, or gramophone, which operates in CAV mode. In CAV mode, the spindle motor turns at a constant speed, which makes the medium pass by the read/write head faster when the head is positioned at the outside of the disk. In contrast, in CLV mode, the spindle motor speed varies so that the medium passes by the head at the same speed regardless of where on the disk the head is positioned. If the disk is recorded at the same areal density throughout, then when read or written in CAV mode, the data rate is higher for the outer tracks than for the inner tracks, whereas in CLV mode, the data rate is the same everywhere. An advantage of CAV mode over CLV is that the drive mechanism is easier to engineer (less expensive to build). Another advantage is that a device can switch from reading one part of a disk to reading another part more quickly, because in CLV mode, when the device moves the head in or out, it must change the speed of the disc. Constant Angular Velocity (CAV) LaserDisc, showing the NTSC field setup and individual scanlines. Gramophone records have always used CAV, including CEDs which provide video signals. CAV was used in the LaserDisc format for interactive titles; it was also used with special editions of certain films. CAV allowed for perfect still frames, as well as random access to any given frame on a disc. Playing time, however, was 30 minutes on each side (these discs are also known as "standard play"), as opposed to 60 minutes on each side for CLV-based discs ("extended play"). CAV is used with the Nintendo GameCube Game disc and Wii Optical disc, the original Xbox discs, and Sega's GD-ROM. ^ "The Criterion Collection: Ghostbusters". voyagerco.com. Voyager Media Store. Archived from the original on 1997-02-13. Retrieved 2012-04-30.